If you are a fancier of parrots but are intimidated by the large size and cost of some of the larger breeds, the East African Brown Parrot might be the perfect breed for you. 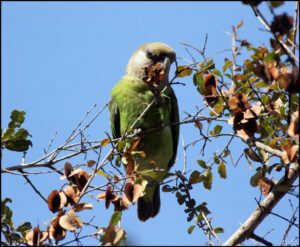 In the wild the East African Brown Parrot has been observed to eat nuts, berries, fruits, and seeds, though they are also known to eat cultivated grain when available. In their natural environment they live in small groups or pairs. Larger groups have been seen, but usually only in areas where food is plentiful. They are generally shy in their natural environment, and for this reason they are fairly difficult to observe. 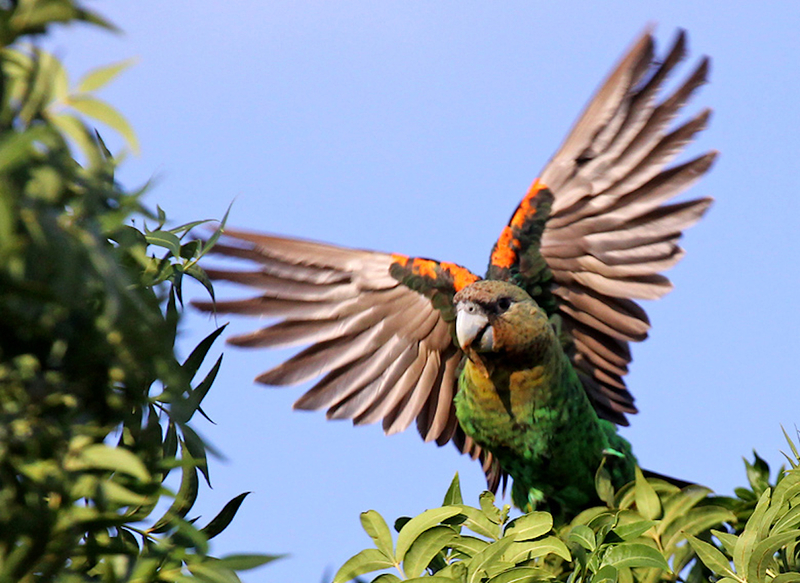 The East African Brown Parrot is among at least six different subspecies of Poicephalus meyeri. The distinction between subspecies has been difficult for researchers. Though the East African Brown Parrot is similar in appearance to the nominate form, it may be most easily identified by its slightly different coloration. Its head is a darker grayish-brown color than the nominate form. Their upper breast is also darker than the Meyer’s Parrot. Their lower breast and abdomen are a light blue to turquoise color. Some sources state that it is bright blue, and that this coloration is its most distinguishing feature. They also have light blue rumps and lower backs. The yellow feathers to the crown may be slightly larger than some other subspecies. Their back and wing covets have a blackish plumage. Like all of the subspecies the East African Brown Parrot has largely gray to brown plumage with yellow on its thighs and wings. They have dark gray bills and orange to red eyes. Males and females may be distinguished by examining their heads and beaks. The head of the male is said to be larger than the female’s, and it also possesses a flatter dome. The beak of the male is also reported to be larger than the female’s beak. Visual identification is by no means reliable with the East African Brown Parrot, and the only way to be 100% sure is through DNA or surgical testing. The average mature East African Brown Parrot will measure eight and a half inches (22 cm) and weigh between three and a half and four and a half ounces (100 – 135 grams). The wingspan of the mature East African Brown Parrot will usually measure between five and a half and six inches (14.1 – 14.9 cm) in length. The East African Brown Parrot is native to Africa and is most common in Southeast Congo, Southeast Kenya, Northern Malawi, and Tanzania. The East African Brown Parrot should be housed in a cage that gives it plenty of room to move. Some people keep them in large aviaries that allow flight. The average enclosure should be 40 inches long x 20 inches deep x 32 inches high. They should have plenty of perches and toys, though they also need room to move and fly. These birds seem to have a special fondness for bathing, so make sure to provide a bath. Breeding the East African Brown Parrot in captivity is more difficult than with some other species. When Breeding the East African Brown Parrot in captivity be sure to check which subspecies you have. 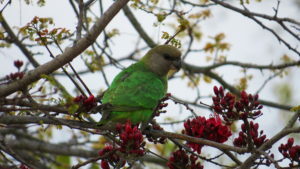 Often other subspecies are bred with the East African Brown Parrot, thus creating hybrids that are not pure East African Brown Parrots. Established pairs of East African Brown Parrots are known to breed readily during the winter breeding season. The average East African Brown Parrot will reach sexual maturity some time between three and four years of age. If successful breeding has occurred, three to four eggs will be laid. These eggs will need an incubation period of 26 to 27 days. Hatchlings will remain with the mother until they are 12 to 13 weeks old, though they are capable of leaving the nest at nine weeks.